We’re heading off to Antarctica with EGT’s unique Penguin Style video pokie, where killer whales, squid and krill are joining some friendly penguins in a party on the ice. Things can heat up with a range of hot bonus features, such as free spins where wins are guaranteed, wild substitutions and the Jackpot Cards progressive round that’s common to all games from EGT. These cartoon characters land across 20 fixed paylines, making up winnings combinations with 3, 4 or 5 of a kind on adjacent reels running from the left side. The minimum stake is 0.20 and there’s a high limit of 40.00 per spin, although free Penguin Style video pokies can be practiced at many casinos. There’s ice all over the place in this pokie, even some of the symbols are encased in in, while the playing card symbol look as if they have been carved from colourful blocks of the stuff. Each of the J, Q, K and A will pay out 5x the line bet when stopping on 3 reels of a payline, while 4 of them are worth 20x and a full run of 5 will result in a win of 100x. There’s a cute shrimp that will be worth wins of 10, 25 or 150x, which is the same as a friendly squid, while the penguin and his goldfish symbol, along with the snowboarding penguin, will each return wins of 15, 30 or 200x. The most valuable standard symbol is a killer whale, who instead of eating the penguins, will award punters with prizes worth 230, 50 or 500x the line bet for 3, 4 or 5 across the reels. Any creature that’s part of a win will become animated, in short sequences that look like something from Happy Feet or the Penguins of Madagascar. A dapper penguin in a top hat is a wild symbol, so he’s able to substitute for others to help complete winlines, and as he’s stacked on any reel that he appears on, this is comparatively easy. It’s also the top valued symbol, paying 50, 200 or 1000x the line bet, but it won’t be able to replace the igloo scatter symbol. This will only appear on the middle reel, and isn’t worth anything on its own, but the real value comes from the 3 free spins that play out anytime it turns up. While 3 free games isn’t much, there’s some special features that ensure each is a winner. The scatter symbol that triggered them will stay locked in place before expanding to the reel positions on the left and right. If more than 1 scatter was on the middle reel, each expands, potentially filling all of the middle 3 reels. It will then transform into wilds, remaining in place throughout the 3 bonus spins. Any symbols on reel 1 will therefore be substituted across reels 2, 3 and 4 resulting in a guaranteed win each time, and multiple wins if the scatter has filled entire reels. The free spins can’t be retriggered. All EGT pokies share a couple of features, and the one players will encounter all the time is the optional gamble game. In Penguin Style, wins of less than 700 coins can be doubled if a playing card is correctly predicted to be from a red or black suit, and if the gamble pays off, there’s another option to collect it, or try to go again for an even bigger prize. Getting the guess wrong will, of course, mean the gamble is lost, and players lose the triggering win along with anything gained in the gamble round so far. EGT pokies also share the Jackpot Cards progressive feature, which has 4 levels, Club, Diamond, Heart and Spade, with the current values displayed above the reels. It’s a random feature that can occur after any spin and takes players to a second screen where they will see 12 playing cards, which they start clicking on to reveal the suits. Once 3 of a kind have been found, the related jackpot is paid out, and if the Spades are found first, then the best prize has been won. Penguins and other polar wildlife seem to be quite a popular theme to be covered by online casino pokie machines. 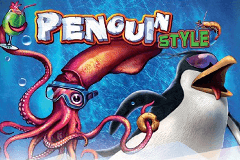 Penguin Style has some cute critters on the reels and some sweet bonus features, notably the free spins with 3 reels having wild symbols on them. If there’s any real issues that can be pointed out, it’s the lack of a mobile-optimised version of this game, and while a 0.20 minimum stake isn’t going to break the bank, some players who are on thin ice may not want to bet this much.